Now that I know that you can take photos inside the Birmingham Musuem & Art Gallery, thought I'd go along and take what I wanted (not the paintings). This is in the part of the museum near Great Charles Street Queensway. On Friday it opened at 10:30am and I got here just in time before the crowds showed up. Some of the museum galleries currently open. The hut I saw from above, now from Gallery 33. 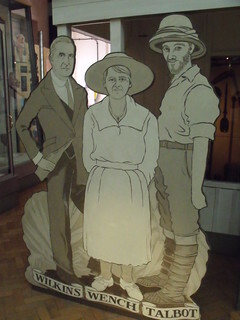 Cardboard cutout on the left - of Wilkins Wench Talbot.